As the story goes, nearly 80 years ago on the Faroe Islands — a stark North Atlantic archipelago 200 miles off the coast of Scotland — a neurologic epidemic may have washed, or rather convoyed, ashore. Before 1940 the incidence of multiple sclerosis on the Faroes was near, if not actually, zero, according to the tantalizing lore I recall from medical school. Yet in the years following British occupation of the islands during World War II, the rate of MS rose dramatically, leading many researchers to assume the outbreak was caused by some unknown germ transmitted by the foreign soldiers. We now know that MS is not infectious in the true sense of the word. It is not contagious in the way, say, the flu is. But infection does likely play a role in MS.
As may be the case in Alzheimer's disease, it's looking more and more as though MS strikes when infectious, genetic and immune factors gang up to eventually impair the function of neurons in the brain and spinal cord. Researchers are hoping to better understand this network of influences to develop more effective ways to treat MS and perhaps prevent it in the first place. In the MS-free brain, electrical impulses zip down nerve fibers called axons causing the release of neurotransmitters. The wiring allows neurons to communicate with each other and generate biologic wonders like thought, sensation and movement. In many regions of the brain those axons are encased in an insulating jacket of protein and fat called myelin, which increases the speed that electrical nerve impulses travel. In MS, myelin breaks down and scars – it becomes "sclerotic" and degrades nerve function. A pickle for researchers has been figuring out how this process starts. There is certainly a genetic component at work: The risk of developing MS is 1 in 1,000 in the general population; it rises to about 1 in 4 in identical twins in which one twin is affected. Even so, genes don't explain it all. MS occurs more frequently at higher latitudes, suggesting that vitamin D deficiency might play a role in disease risk (the vitamin's production in the body is dependent on sun exposure). Smoking also increases risk for the disease, as does obesity. And while the tale of the Faroe Islands is disputed – large scale retroactive epidemiological studies are notoriously hard to pull off – it is for the most part accepted that microbes play some role in MS given that dozens of microbes, including the Epstein-Barr virus, have been tied to MS. Yet more than 30 years of research suggests that risk factors in MS ultimately converge on the crux of its pathology: a misguided immune attack on myelin. 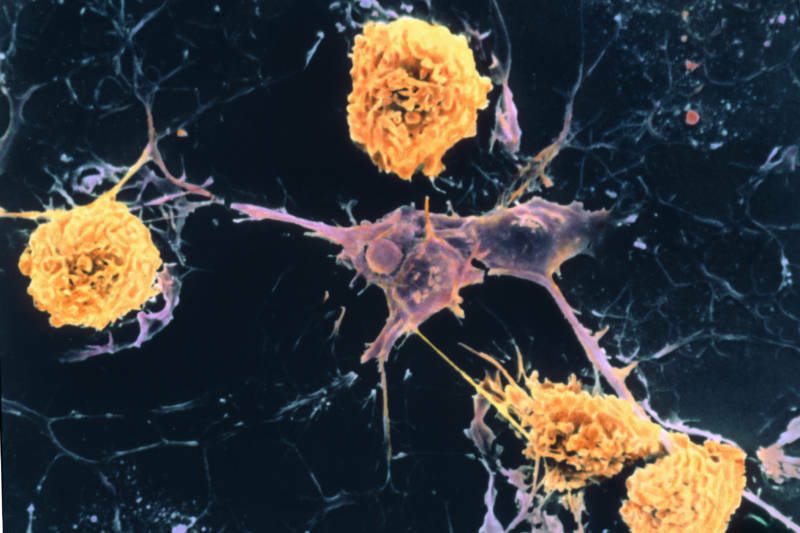 Research in animals and humans supports the idea that MS develops when a type of white blood cell called a T-cell attacks specific proteins in myelin, making the axons less able to conduct electrical impulses efficiently. The immune siege appears to be a result of something called "molecular mimicry." Normally the body's immune system attacks foreign invaders like viruses and bacteria. If a molecule that's part of the body happens to closely resemble a portion of an intruding microbe, then both molecules can be targeted. Put another way, say a particular protein on the surface of a virus is similar in structure to a protein found in myelin. The immune system ramps up to clear the virus but also attacks the myelin. It's a case of mistaken identity, of collateral damage. Dr. Roland Martin from the University Hospital of Zurich in Switzerland is among the researchers who over the years helped identify which myelin proteins and peptides – biologic building blocks made of amino acids — come under attack in MS and which cells and immune molecules do the attacking. "The idea of molecular mimicry is one of the most important ones in MS," Martin says. "We and others have shown that mimicry between myelin peptides and viral and bacterial peptides indeed exists." And a number of proteins that make up myelin have been identified as helping spark the immune activity behind MS, possibly in response to similar microbial cousins. Now, a paper co-authored by Martin, and published in October in Science and Translational Medicine, reports on an additional nonmyelin-related protein that also may be involved. Martin and his colleagues examined protein samples from the brains of 31 people who had died from suspected or confirmed MS. T-cells from 12 people reacted to the clunkily named enzyme, guanosine diphosphate-L-fucose synthase – or GDP-L-fucose synthase. The enzyme is normally involved in processing sugars essential to cellular function and communication, including that of neurons. Paper co-author Mireia Sospedra, also of the University Hospital of Zurich, likens the enzyme to the iceberg's ominous tip. "Yes, [myelin proteins] make sense but we think they might be not the only ones involved," she speculates. "We think is that other auto-antigens might be involved in initiating the disease." She believes that the attack on this newly identified auto-antigen triggers tissue damage that exposes other proteins in myelin that are subsequently attacked themselves. Sospedra also makes the point that culprit antigens might be different in everyone. The structure of our molecular machinery is genetically determined. Certain variants in, say, myelin protein structure might be more prone to immune attack; also genetic variation in immune cells themselves could influence how the body responds to a particular infection. Northwestern University immunology professor Stephen Miller – who was not involved in the new research but who has collaborated with Martin in the past — sees the findings as revealing another piece in the MS puzzle. "I don't think there's one particular virus or bacteria or environmental factor that triggers MS in every patient. There are probably many things that can trigger an autoimmune reaction against a particular infection," he says. "But the more antigens we identify that can contribute to the disease the better." Regardless of the particular "cause" in a given patient, Martin, Miller and a number of other researchers are hard at work trying to thwart the MS immune attack in the first place using by coaxing the body into building up a familiarity and tolerance to suspected antigens, something called immunotolerance therapy. It's a similar concept to how certain allergies can be thwarted by exposure to small amounts of a particular allergen. "Think of it as a sort of negative vaccine," says Miller. "We want less immune activity, not more." The sizable batch of approved MS medications for the most part work by broadly suppressing the immune system. They help control symptoms but also leave patients vulnerable to side effects like common infections. Antigen-specific therapy only tames the immune response to specific antigens of interest. In theory it should come with fewer risks. Miller recently co-founded a startup called Cour Pharmaceuticals through which he and his colleagues are studying the potential for immunotolerance therapy for MS and a number of other conditions, including celiac disease and Type I diabetes. The experimental therapy they plan to test involves attaching known MS-inducing antigens to biodegradable nanoparticles which they will then inject into trial patients. But for now they've just completed a phase I study testing their approach in celiac disease, with a phase II trial about to begin. Martin's group is pursuing a similar approach in which they chemically combine red or white blood cells with MS antigens and infuse them back into patients to induce tolerance. This research is at a very early stage, but both groups are optimistic. "Several of us in academia — and also the pharmaceutical industry — are pursing the long-standing dream of many immunologists: inducing tolerance against specific target antigens in autoimmune diseases like MS," says Martin. "I am confident that sooner or later, we will be successful." Bret Stetka is a writer based in New York and an editorial director at Medscape. A graduate of the University of Virginia School of Medicine, Stetka has had his work published by Wired, Scientific American and The Atlantic.com. He's also on Twitter: @BretStetka.